rodeasdown.com.au – You may never need this heavy hitting record cleaner, but when you do it works. Much in hi fi turns out to be more complicated than it first looks. That’s probably why I kept avoiding the Vinyl Record Cleaning system (VRC) that arrived for test. Record cleaners are popping up like seagulls at beachside cafés lately and many are based around either fine-bristled brushes or immersion of the record’s playing surface in special cleaning fluid. There are also vacuum systems and ultrasonic cleaners. As with many things in hi fi, you can spend modestly or fly right out there to the dizzying limits of belief. The VRC is different. Okay, it appears fussy and complex and when you read the instruction booklet it only seems more so, but it turns out that using it is a great deal simpler and quicker than you’d think. By all means read the instructions but my advice is to go straight to the six-and-a-half-minute demo video. The instructions say it’s on the company website but I couldn’t find at first pass; turns out it’s at the bottom of the ‘Results’ page. I got it on YouTube after protracted scrolling. The VRC works by applying a dense cleaning fluid to the record’s surface. According to the book this dries in an hour or so, it took several for me. Then peel off the dried film, which brings the grit with it. Ideally this would come off smoothly as one piece, but most times it doesn’t and little bits of stringy residue, like cobwebs, stick around and must be lifted by dabbing with sticky tape. If you love your stylus make sure to get it all. 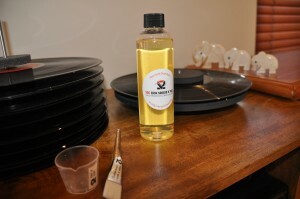 The recommended amount of cleaner for one side of a 12-inch LP is five millilitres and that’s not much. Until you get used to pouring the syrupy mixture it can be easy to overshoot the 5-ml mark in the supplied measuring cup, but every skill requires practice and it doesn’t take much to get this right. Applying such a small amount of fluid over the surface sounds challenging, but you’re supplied with a simple turntable, that spins up by hand, and a brush and they make spreading the gloop straightforward. Take care of that brush and wash it out after use. Warm water works best. The VRC comes from Wentworth Falls in the Blue Mountains and it gets cold up there, so mods have been made to the cleaning fluid because it doesn’t handle low temperatures well. The lesson, I guess, is to buy in summer. Maybe not at all if you live in Tasmania. My experience suggests it thickens up further with age so it’s best used fresh. 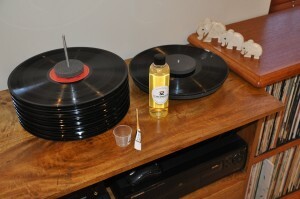 A separate drying stand allows you to treat both sides of up to 14 records in one session, necessitating 140 ml of cleaning fluid. Unless you option up, the system comes with a 110-ml bottle, enough for 22 sides. A 275-ml bottle is available for $44.95, or in a two-pack for $89.95 with a brush and a measuring cup. Important point: The VRC is for extreme cases, when a record has been spilled upon, dropped in the dirt or bought at a garage sale from someone who beat it up. One application should get rid of everything. If you’re one of those who stores your records carefully and uses a good record cleaning brush before every play you’ll likely never need a cleaner as heavy duty as this. But when you do need it, it works. Just make sure to do a few practice runs first. 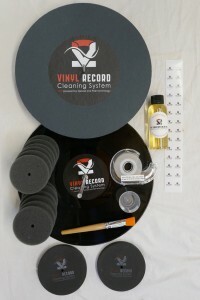 The kit costs $189.95 from www.vinylrecordcleaningsystem.com. Prices don’t include postage. First published by smh.com.au November 2018.